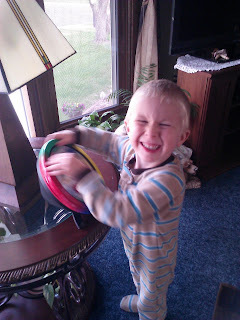 I am always looking for fun new ways to challenge my son when it comes to activities to do in the house. He learns and conquers things so quickly and he easily becomes bored so I have to always be switching toys and encouraging him to play with new toys each day! When we received the Rubik's Rock N' Roll Maze from Tollytots for review, he was instantly intrigued and really liked the music, lights and challenge of getting the ball into the right hole! Inspired by the engaging ball movement seen in games like pin ball and bagatelle, the Rubik's Rock N' Roll Maze by Tollytots has a conical base that makes the maze so much more interesting to solve! Choose one of three different puzzle modes, then spin the unit to move the ball through the maze. Flashing lights indicate your target zone as music and sound effects add excitement. This is a toy that will definitely grow with my son! It has a conical base but it has legs that pull out to make it easier to hold for younger children. Once they get older, they can put the legs back in for a more challenging play. Also, there are different modes and some are harder than others. This is a good game for home or even in the car and it is great for ages 3+! Buy It: You can purchase the Rubik's Rock N' Roll Maze for $24.99 exclusively from Toys "R" Us. 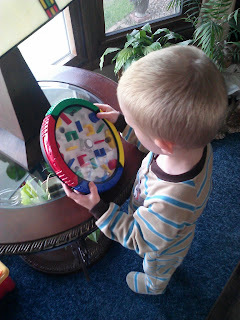 Win It: Tollytots is generously offering (1) Rubik's Rock N' Roll Maze to a lucky winner!